An Expert Advisor based on the "Two sides of he martingale" strategy. Martingale is a betting management system. This type of strategy is very popular in roulette. This principle is also widely used in Forex. After starting the EA we open two opposite deals - BUY and SELL. The initial stop loss should be equal to the take profit. 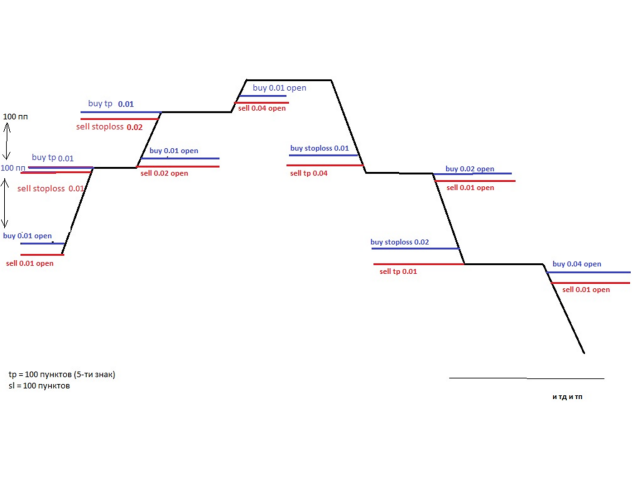 For example: StopLoss = 100, TakeProfit = 100. StopLoss - the stop loss value, 0 - not used. MarketWatch - trading mode. If MarketWatch = true, first positions/orders without stops are placed, and then they are modified (for some brokers). Martin - the martingale coefficient for the deal following the losing one. If 1, then it is not used. MaxSpreadToNotTrade - maximum spread filter for opening trades. MinSpreadToNotTrade - minimum spread filter for opening trades. MaxOrders = maximum number of legs (trades) in one series in one series. AdjustTP - adjustment of the take profit in points. AdjustAfter - the number of the leg, after which the take profit will be increased\decreased by AdjustTP points. StopDayTradingEaAfterTP - stop the EA operation after reaching take profit in the current day. The EA starts trading the next day only. TrailingStopUSE - use trailing stop. 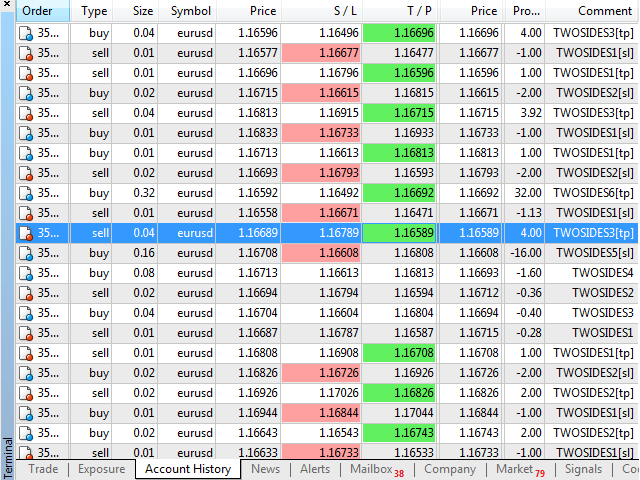 IfProfTrail - use the breakeven mode only for profitable positions. TrailingStop - trailing distance, 0 - the minimum allowed. 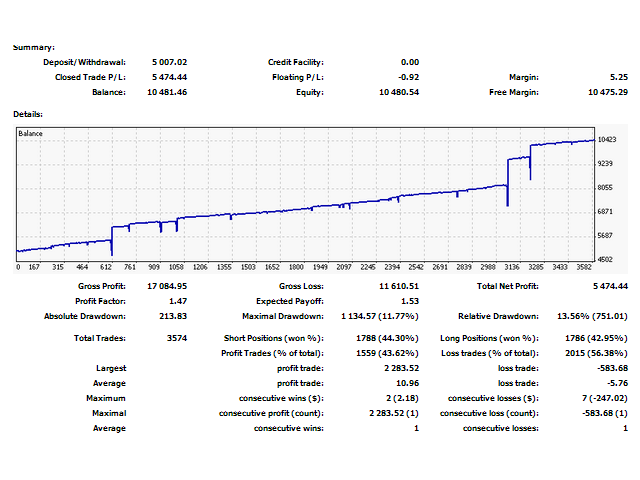 Attention: Martingale is a very dangerous trading strategy and requires a large account balance. - Increased the algorithm processing speed towards performance and receiving signals. - Added the SecondsToRefresh parameter to the EAPADPRO block - refresh rate of the information on the chart (default is 10 seconds). This is done to reduce the CPU load. 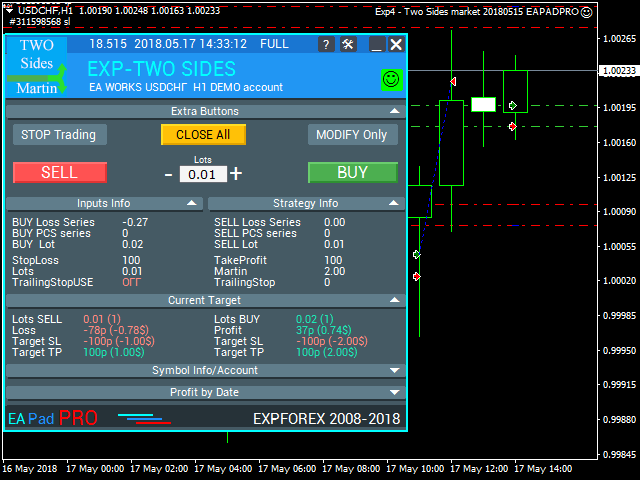 AdjustTP - adjust the take profit when opening pending orders. AdjustAfter - number of the left after which the adjustment will be applied. Once the EA places AdjustAfter amount of orders, the take profit of the next trade will be increased by AdjustTP * (NumberOfLegs - AdjustAfter) points. When positions are closed by stop loss, the loss includes not only the stop loss level, but also the spread, especially if it is floating. In order to achieve the take profit that can cover all previous stop losses, it is necessary to increase the take profit of each new pending order. This feature allows doing that. If MaxOrders=5, and 5th position (for example) in the current grid in one direction closed in a loss, then the next leg will be opened with the initial lot, and the grid will start working from the new position. The Expert Advisor has been compiled in the latest terminal build.